The sky is ablaze with glorious colours- fiery red, searing orange yet the outer edge of the blazing sky had begun to cool with the indigo of the night. The golden globe of sun was slowly descending in the backdrop of red-orange water and one could see all the colours of rainbow reflecting off the sea as the sun and water becomes one. You see the birds heading back to their nest and hear the roaring sound of tides hitting the shore. A light, cool breeze sweeps across, wiping all the stress and worries. You take a deep breath inhaling the smell of sea, sand and Bhutta…. Yes, ‘Bhutta’ or ‘Makkaai’ in Hindi is the roasted corn on cob. When the first rain indicated the onset of Monsoons in India, I would eagerly look forward for delicious treat. 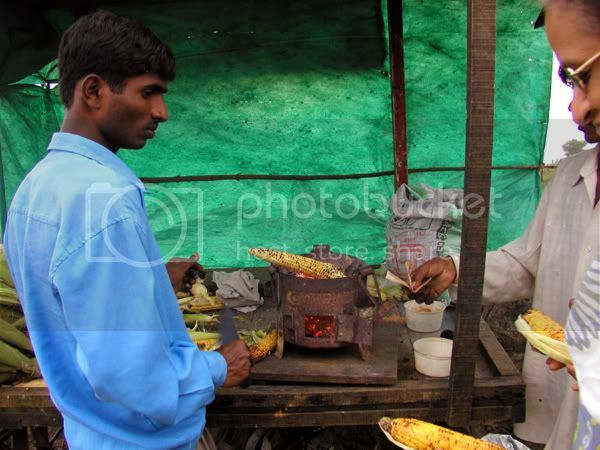 The sight of corn vendor or Bhuttawalah with his wooden cart stocked high with fresh corn and a small coal stove would make my taste buds tingle and eyes twinkle. Parked on road side, beaches, cricket play grounds, school/collage gates, this corner, that corner, every nook and corner would become the center of frenzied activity as the Bhuttawalah’s lured the passers-by with the delicious roasted aroma of Bhutta being roasted on open charcoal stove. The smell of the fresh roasted corns is so enticing that people are drawn to the cart to pick and choose the Bhutta. The process of eating these Bhutta may sound very simple and straight forward but to actually experience the real taste of Bhutta the process starts right from selecting the right corn; the one which is neither too hard nor too tender. The hard ones with yellow colours give your teeth a tough time to chew and the tender one with creamy colour leaves you unsatisfied and wanting for more. The trick to get the right one is to open the husks and poke few of the kernels by digging your sharp nails to see how fresh and right the corn is. Once the right corn is selected, the Bhuttawalah puts the corn on iron coal stove and keeps turning the corn to roast it evenly. Within few minutes of perfect technique of roasting as he fans the coal to keep them astir, you have your aromatic, roasted corn on the cob ready. The best is yet to come… that is the zesty end to the Bhutta story. With freshly cut piece of lime dipped into a mixture of hot red chilli powder and salt, the Bhuttawalah artfully massages the length of cob, leaving trails of hot, sweet and sour flavour all over the kernels. If you are like someone like me who likes to test her spice scale then you are in for treat. With another coat of fiery green chilli chutney deftly applied on them you will be testing your spice scale to its limit. Can’t handle too much of spice? No worries. Bhuttawalah is too happy to apply silky butter which will melt at the very touch of hot Bhutta. As the butter dissolves chilli, lime, salt and chilli chutney creating perfect harmony of flavours, the pleasure of biting into Bhutta and savouring the taste is something which one needs to experience to understand. I do agree with you Mr. Thoreau. With non-stop rain pouring without any break, all I could think of is biting into sweet, spicy, tangy and hot Bhutta. It being Sunday evening and all the supermarkets closed I had to settle for canned Sweet Corn!!! I chose to make Sundal which is usually made using Black or White Chickpeas/Kabuli Channa and is given as Prasadam in most of South Indian Temples. Cooked black/white channa is tempered with mustard and urad dal and garnished with fresh coconut flakes is my favourite Prasadam in Temple which always makes me wanting for more. To this basic recipe of Sundal I used canned sweet corns which quite surprisingly tasted great. This crisp sweet corn is sautéed lightly with crunchy onion and sweet tomatoes with a touch of green chilli and a splash of lime juice to give it a zest. It was a quick and great snack to munch on while we watched rain dancing around us. I am sending this to lovely Mansi of Fun and Food who is hosting fun event Game Night Party as its a perfect dish to prepare within ten mins and enjoy with your friends. Heat oil in a pan and add mustard seeds, red dry chilli and curry leaves. When mustard starts to pop and splutter add finely chopped red onion, green chilli and sauté it for 30 seconds. Now add finely chopped tomato, sweet corn, salt to taste and sauté it for 1-2 mins over medium flame. Turn off the gas, add lime juice and chopped coriander leaves and mix well. Serve hot and enjoy. Add grated fresh coconut and raw mango to get different flavour. Replace sweet corn to cooked black or white kabuli channa. Omit onion when preparing it for Neivedyam. Nice picture of corn sundal.I learnt this from my mom and i do omit onion when i offer as neivedhyam.i will give a try your tomato added version. Sups, very nostalgic post yaar! Rain and spicy bhutta! Bring it on :-D. Be it roasted, or boiled, corn is yummy! Love the corn sundal, gorgeous and delicious. Love this corn-y affair! Beautifully written! and thanks for the credits! And loved your variation of the sundal with canned corn. That Thoreau says it nicely, Ms Spice! 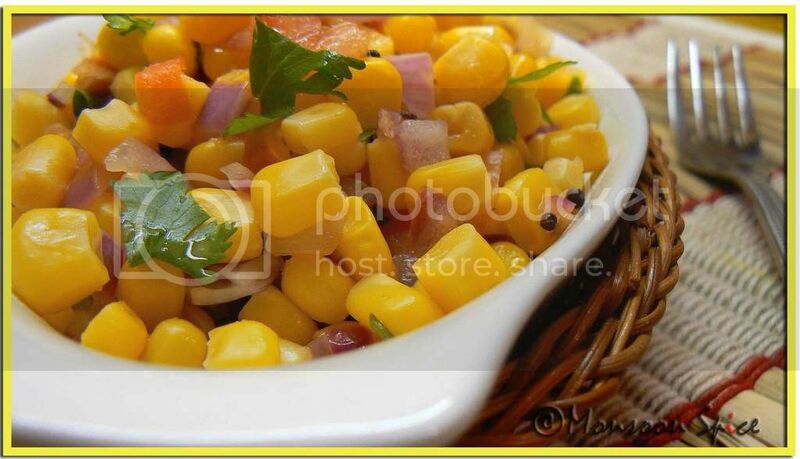 I love corn - the variety of ways one can use it in a meal is incredible. Yet another corny corn recipe to add to my must trys! Ohh thos butta(bhutta) pictures bring back so many memories. I loved them. Sweet corn sundal looks great. Know exactly what you mean, roasted corn on the cob is the best way to eat them for sure. Corn sundal that is something I sure want to try. The smell of bhutta always brings back memories of Marine Drive in the monsoon....thanks for that lovely memory - your sundal looks like a burst of sunshine on this dreary winter's day! Corn Sundal! !..Colourful and Cheery!! !What a brilliant idea, Sia??:0.. ..after all who can resist cooked corn?.. Hi Sia, I am back after a long time. Your new webpage looks very good. Corn Sundal looks terrific! Im visiting after a while sia. great recipes and great pics and recipes indeed. The corn sundal is a must try!! Oh Sups, thats what we expect from you , a loving long post after you get back from India. 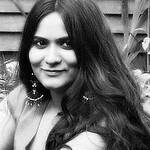 I cant help myself to get lost in those memories of India. and the irony is I have no choice to get those hot baked corns here. Good one .... Nice pics sia!! wow, that looks sooo pretty! Beautiful color! The golden corn looks delicious. The first picture is very nostalgic to me. nice pictures. Hi, I prefer the corn plain, without the lime and chilli, tho' that has its own charm. A good ear of sweet corn tastes nice and juicy even when it's raw. Nice post! hey girl, u will surely get to taste corn soon:) america is the number one country in corn production. Sia, that bhutta grilling pic is so eye-catching! it brough back too many fond memories:) and I love your Sundal...kind of like corn salsa, right! Within few minutes of perfect technique of roasting as he fans the coal to keep them astir, you have your aromatic, roasted corn on the cob ready. The best is yet to come… that is the zesty end to the Bhutta story. With freshly cut piece of lime dipped into a mixture of hot red chilli powder and salt, the Bhuttawalah artfully massages the length of cob, leaving trails of hot, sweet and sour flavour all over the kernels. - I would give anything to taste this. Hey Sia.. Corn Sundal looks fab as ever. Sorry I haven't been in touch for such a long time.. although I keep visiting the blogspots whenever I find time. I just started work and in the process of getting used to it. Hoping to return back to blogging very soon. BTW, the marathon went great. I finished it in 5 hours which was a PR for me. I will send some pics your way soon. Take care ! Looks so beautiful Sup!! Amazing color and who can resist bhutta?? I love our typical way of roasting on charcoal, u get an amazing flavour to it?? don't u?? You have a great blog going and I shall be back. sia, have you tried putting the corn under the broiler? you won't get the smoking coal flavour, but it's the next best thing to bhutta. 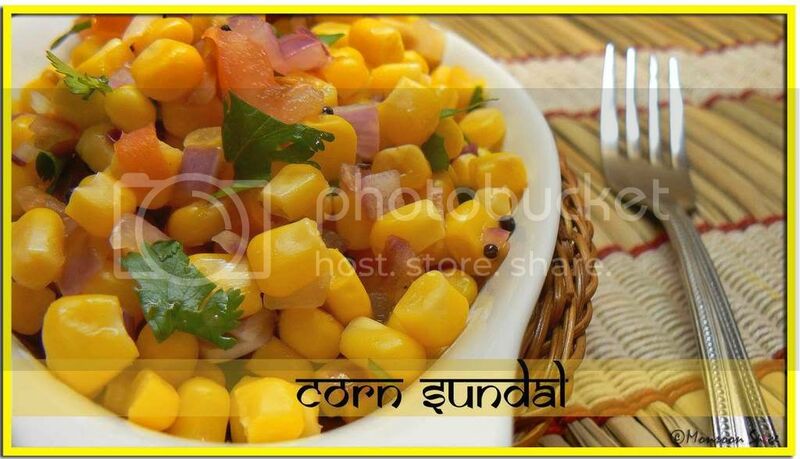 Beautiful picture of corn sundal. I never tried, I make butter corn or masala corn. Beautiful pictures sia. Got me drooling on this one too. I've not made corn sundal before but will try it soon.